First, what is Circle? 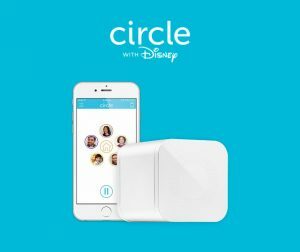 It is a smart device that pairs with your existing router (Is My Router Compatible With Circle) to give parents extensive management capabilities of every device on their home network using the Circle app on their smartphone. Some of the higher-end Netgear routers now also come with an option to enable Circle without having to purchase the Circle device. This includes PC’s, Macs, game systems etc. but it is very simple to exclude devices from the network management of Circle, for example, if you have a smart thermostat like Nest or a Rachio smart sprinkler system. The app makes network management simple and easy. In fact, with a few touches on the Circle app you can pause your whole network entirely to bring everyone to dinner promptly or “encourage” other disconnected family time. Circle is a little bigger than a Rubik’s cube and is extremely easy to set up. It even has a battery backup to prevent turning it off by unplugging it. Circle sells for about $99 from a variety of retailers. 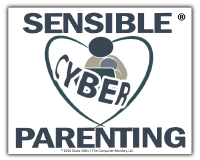 It can be purchased here from Circle to automatically receive a $10 Sensible Cyber Parenting discount (the discount code is also listed at the bottom of this page). To get started with Circle, you connect the power cord, download the app and then it clearly and simply walks you through connecting the device to your network through wireless pairing. After Circle is connected to your network, the app walks you through adding yourself as the administrator (you can have more than one) and then you set up each user and assign the devices on your network to each user. You can see the exact process here: Circle Support – How Do I Set Up Circle? There is an ethernet cable in the box that is not required but it is a good idea to use it so that Circle can work at the optimum speed. 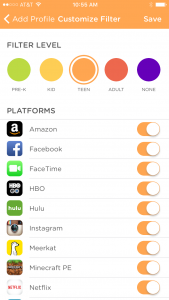 Circle gives you extensive filtering options for age-appropriate content, apps and categories. Filtering is not just limited to apps but also common websites like Amazon. Tapping on the platform item will give more information about that item to help you decide about allowing it or not. Additionally, you can block ads, turn on YouTube Restricted mode and turn on Google Safe search, which also disables Bing and Yahoo searches. It is worth noting that at the present time Circle is unable to enforce the YouTube Restricted mode for the mobile app. 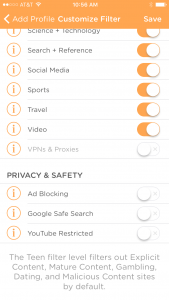 The screenshots below show just some of the filtering options. In addition to filtering for content concerns, the developers at Circle understand that when it comes to kids and electronic devices, time limits are very important (for many parents too, if we are honest!) and somewhat difficult to manage. The time limit features of Circle are some of the best I’ve seen because there are so many options. Bedtime can be imposed and you can limit the total number of minutes or hours of screen time, but better still, you can set limits within various apps or platforms. For example, you may set the allowed screen time to 2 hours, but also set Minecraft PE time to 30 minutes within that allotted time. 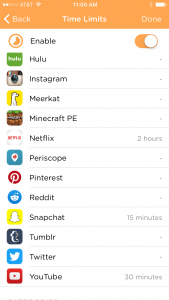 Time limits may also be chosen by categories, such as App Store, Blogs, Health, Online Games and Science + Technology. (If your kids are spending too much time on Science and Technology categories there could be a scholarship in their future!) In addition to setting up time limits for your kids, you can also set limits (and any other restriction) for yourself. This feature can help parents realize how much time we can waste on our devices — wow, have I really been on Facebook for an hour today? In fact, each member of the family can see their usage stats, time limit information and some additional Disney-sponsored content on their personal MyCircle Dashboard . The most difficult thing about setting up Circle is assigning devices to each user on your network. When you look at the list of devices some of them may be hard to distinguish. You can touch the device name to get more information and see what the MAC address is. The MAC address is a unique code given to each device. You may then have to look at the About screen on iOS devices or the label on other devices to match up the MAC address to whose device it is. Here is a page from the Circle support website that gives an example of this part of the setup process. The names in their example might be simple compared to the ones that show up on your network, but don’t let that keep you from getting Circle if you decide it is the best option for your family. This part could be a little tricky but it’s not a deal breaker by any means. In addition to their support page, Circle has excellent, prompt support via chat, phone or email if you need help with device assignment or other Circle issues. See the end of this post for detailed contact information for Circle support. 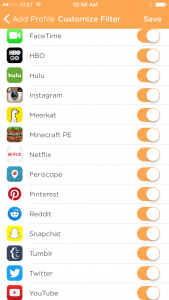 In addition to overall screen time, Circle lets parents set time limits within apps or categories. So you may be thinking that Circle sounds like a great option to protect and manage your kids’ devices at home, but what about when they leave? Circle has come out with CircleGo for iOS and Android devices. Circle Go offers Circle customers additional mobile protection for up to ten devices for $4.99/month using the same Circle app. I have not tested it yet, but if CircleGo works as well as Circle it will be an outstanding choice for family online protection. I did confirm with Circle support that Circle Go will suspend itself for your child’s school network. This is a feature that is important for mobile management applications to avoid connection issues while they are at school. To say that I am excited about Circle is really an understatement. The goal of SCP is to help parents protect their kids in the simplest and most cost-effective way that works. Circle is simple, feature-rich and it works well but it is a premium product. If you can afford it, the ease and functionality of Circle make it worth it. If not, here are other parental control products recommended by SCP with varying price tags. I would argue that if you are providing your kids with smart devices (which are pretty pricey), protection needs to be considered in the “cost of doing business”. It’s like buying a pet. You also have to consider the cost of going to the veterinarian. Any control or monitoring product recommendations by SCP are solely based on the performance and effectiveness of the product, not on affiliate relationships. You can read more here about how I work to inform and empower parents so they are better able to protect their kids online. Please search the SCP website for more information about Parental Controls and remember that no product is full-proof or “set it and forget it”. You need to stay vigilant and frequently monitor the products you use to make sure that they are still installed correctly and working properly. I couldn’t get circle to work with u-verse. Whn I contacted circle they told me to disable my firewall. THis meant it was time to do a circle product return as disabling my firewall was my only protection against the outside world. Sorry circle! You are not in my circle! Ingrid, thank you for your comment. I was not aware that Uverse doesn’t allow Circle to function properly. But, unfortunately, it doesn’t surprise me. I have worked on issues with other parental control products and Uverse. One that quickly comes to mind is OpenDNS as noted here in a previous post – https://sensiblecyberparenting.com/att-u-verse-and-router-based-parental-controls/. I would argue that the problem is Uverse and their proprietary equipment that does not allow people to control basic settings that any other router on the market is going to let you control. That is one reason that Uverse would not be in my home.